One of the most valuable and strategic tools in your trade show tool bag is video. We know that attracting the attention of a trade show audience is definitely a challenge. You can readily catch the eye of the trade show attendee with color, movement and sound. You will lead your audience to want to learn more about your company or product with a large video presence that carries a quick message and is easy to digest. You’ve just added major value to your trade show event if you can capture an engaging visual to make your audience primed and pumped to want to learn more about you. OK, you’ve got a great video. You’ve spent the time and energy in putting together a video that has a quick impact, is upbeat, and most of all, is done by a professional. You don’t get a second chance to make a first impression. Now you need to make sure to that you do everything you can to ensure your video marketing efforts don’t fall flat. Here are some tips on making sure that your precious trade show video marketing efforts run with success. 1. Include the video on your trade show checklist. Any new marketing materials that go to a show, especially if they are developed specifically for the show itself, cannot be forgotten. If you are managing the trade show booth yourself, you’ll need a checklist. On this checklist, don’t forget to include the video. A client had forgotten to bring their DVD video (in the old days it was VHS) to the trade show. As a result, the trade show booth had beautiful monitors that we had designed into booth walls that were turned off for the entire show. These expensive pieces of equipment that were supposed to be displaying the client’s brand video could not be used, as the client did not have anything to be displayed on the monitors in the video’s place. In the past, we would often encourage the client to send us their videos to keep in the trade show display crate, which we would put into storage. Because this was a new brand video that has been produced, we could not ship the video with the booth in time. 2. Always have a backup video. Another trade show client always left their DVD inside a DVD player that they had shipped to us. We stored this with the trade show booth (just as we had advised the previous client to do). But, at the last trade show, although we checked that the video equipment and DVD were in working order before they shipped, the DVD player had disappeared. Always ensure that there is a duplicate video available in case the first is lost or damaged. We could have easily purchased a new DVD player ($50 and a trip to the store), but the client said they did not have a backup video available. 3. Have an alternative way of playing the video. We had multiple phone calls with the client before the event started to make sure that they would have success in playing their eye-catching video. By the end of the day the client realized that he had the video content on his laptop PC. This was great news, as all he would need to play the video on the exhibit monitors was a cable. We knew that we he had the cable we had already shipped to the trade show booth for the event. Because we ensured that there was another way to play the video other than just the DVD player, the video was able to be played through his laptop with an AV cable connected to the monitor in the booth. If you choose to do this, make sure you have a cable that is long enough to connect to the peripheral device that you will be playing the video on. We recommend keeping one copy of your precious video cargo with you, and if you are shipping your trade show exhibit, ship another copy with the exhibit (But don’t keep the video in the player, in case the video player is lost!) You can adhere it to the trade show exhibit, ship it in a bag, or with literature shipped with the booth. If you are working with a trade show exhibit company, ask your project manager how it would be best to ship the video with the exhibit. 5. Check the video and equipment before going to a show. Video is an effective medium, there’s no question about that. Video can be seen by attendees from across the trade show floor. Not only is it important that your be at the event, but it’s crucial that your video is portraying you in the best possible way. 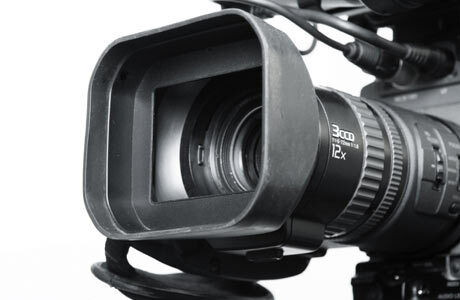 The video and the equipment/devices it will be displayed on are a medium to portray your brand message. But you will only risk damaging your brand with video or equipment that won’t function properly. Check it before you go to each trade show. 6. Use digital technology to make a hardcopy backup of your video. There are a few options for making hardcopy backups of your video. a) A thumbdrive or a USB device takes up minimal room and can be invaluable if there is a need to make an additional copy of the video while on the road. b) A digital copy on your laptop or netbook PC will also make it very simple to either play the video directly from your computer through an A/V cable (as we did in the earlier example), or to burn another copy of a disc to be played in a DVD player. If you are playing your video on a tablet, prepare for not having Wi-Fi. You can watch or display any video on iPad in an MP4 format. The MP4 format can be a little sticky at times to work with, but there is software (like iFlicks – just search on the internet for a video converter). Are you playing video on a Droid? If you should be displaying a PowerPoint presentation, the Slideshark app will convert it to being played on an iPad without an internet connection. Although you may pay a fee at the trade show for Wi Fi, you might be located at the event on a floor that might not get good reception. Imagine all the trade show booths with QR codes unable to be scanned and videos on the internet waiting that cannot be viewed without Wi-Fi! We exhibited at a trade show recently in the lower level, which did not adequately get Wi Fi. Because the QR code we had generated and displayed at the event would take a visitor to an online survey, we made sure that the survey was printed, so the attendee could fill it out just in case there was no Wi-Fi. By making sure that we had prepared for not having Wi-Fi, we were able to generate many leads successfully. Research the best way for you to be able to have the video play on your device without having to be dependent on Wi Fi. So you’ve gotten to the trade show and forgotten to make a hard copy of the video, haven’t downloaded it to a thumb drive, and it’s not on a tablet. Now what? There are a number of ways that you can make video content available on the web (“cloud”) for you to be able to download. Check with show services at the trade show or trade show organizer at the convention center. If your video is available on your company website (maybe it’s embedded on one of the web pages), you can use RealPlayer to download the video into a folder and then copy it to a disk or other device. You also can upload the video to a private directory into your YouTube account, which you can download (and play without Wi Fi). If you have uploaded the video to Vimeo, you won’t be able to download it for play without Wi Fi, as it uses a flash player. You can sign up for file storage for relatively cheap (or free), with services like Boxnet and DropBox. There are also paid cloud-based storage services like LiveDrive. These tools are great because you can also have access with mobile apps. It might also be possible to upload your video to Google Docs, or to Google Video for the world to see. Just check to see which site works best for your needs. This entry was posted in Uncategorized, Video and tagged nj trade show displays, nj trade show exhibits, trade show marketing, trade show video. Bookmark the permalink.